Nestled at the foot of Hood Mountain between Santa Rosa and Sonoma on Hwy 12. The late Joe Martin founded St. Francis Winery. He helped turn California Merlot into a household name. More than 380 acres of Estate Vineyards in Sonoma and Russian River Valley. Named after St. Francis of Assisi. Patron saint and protector of animals and ecology. St. Francis is believed to be the first to bring European grape cultivation to the New World. A walk across the stone bridge entrance transports visitors back to California’s early days. A statue of St Francis is located just before you reach the bell tower. The bell tower is home to a 1,000 lb. bronze bell crafted in Italy. Mission Style, spacious tasting room with tiled floors, large windows and cozy fireplace. Shop in the well-stocked gift shop for wine related items and logo clothing. Wine Tasting daily 10:00-5:00 pm. $15pp fee waived with purchase of two bottles. Self Guided Tour: offered daily, follow the station signs. Estate Vineyard Tour and Tasting: $25 pp, Fri-Sun, 10:30 am. By appointment. 5 Course Gourmet Lunch: $70 pp. Thurs-Monday. By appointment: 11:00, 1:00 and 3:00. Plan for 1 ½ hours. Chef selects ingredients from the 2 acre Estate Garden. Small plate servings with 5 wines. Seated at a large round table in a private room. Soft music playing and two wine educators to answer questions. St. Francis Old Vine Zinfandel is a favorite of critics. Average Price $45. Some at $17 or $22. Hard to believe a winery was voted best restaurant?!?!?!?! Although St. Francis is not a traditional restaurant, guests experience an exceptional feast for the senses. 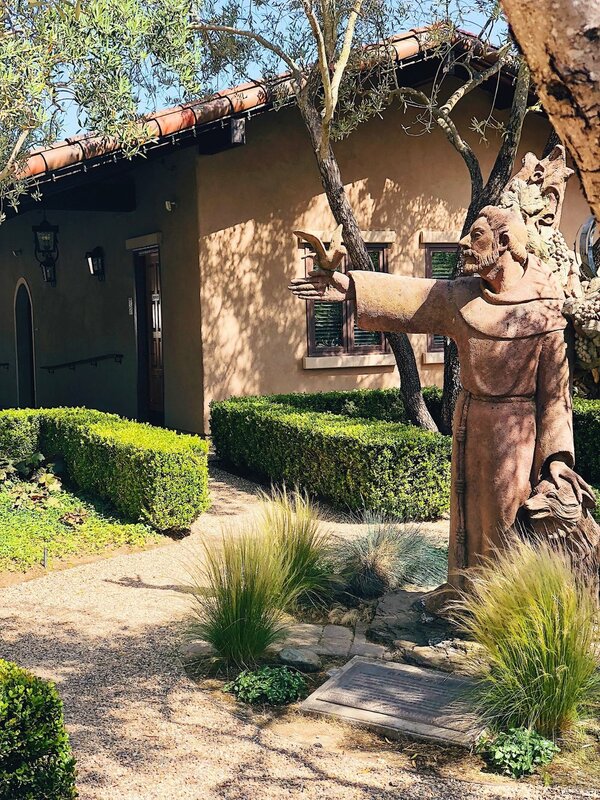 St. Francis is Zagat recommended for wine and food pairings. For two years, 2013 and 2015, OpenTable.com awarded St. Francis the nation’s number one restaurant. Beating out restaurants in New York, San Francisco and Napa! 90 minutes of world class food, wine and conversation. Katie Madigan started as an intern at St Francis when she was 21. 16 years later Katie continues to use her chemistry and wine making talents at St Francis. She concentrates on Zinfandel and Chardonnay. Best Woman Winemaker of the Year award by International Women’s Wine Competition. Awarded the California Green Medal Award in 2018. Every year, in honor of founder Joe Martin, the tasting room is closed. St. Francis employees spend this day giving back to the community. This year they all worked at Sugerloaf Ridge State Park. No wonder they received a Community medal for strong relationship with its employees and neighbors. I visited in the summer, on a Sunday, when they were mid-concert. Dogs hanging out, people up and dancing with the band, happy kids frolicking, wine being poured. I fortunately live only about 43 minutes away. The drive isn’t too bad. Why don’t we come here more often? I will be back in October for their Blessing of the Animals event. Sonoma Wine Dog needs a good blessing. After researching all of the rave reviews for their food and wine pairing, I will need to come back. Maybe as a Mother’s Day gift to my mom or a holiday treat. The summer concerts and outdoor July film festival events look amazing too! I made sure to follow St. Francis Winery on Facebook, so I can keep in the loop of their upcoming events.